Comprehensive Health Insurance: Billing, Coding, and Reimbursement provides readers with the knowledge and skills needed to work in a variety of administrative positions in the medical field. It covers the foundations of insurance, billing, coding, and reimbursement, offering a comprehensive view of how each element in the process affects all other steps. Students learn not only the submission of claims to the insurance carrier, but also reviewing medical records, verifying patient benefits, submitting a secondary claim, posting payments and appealing the insurance carrier's decision. Numerous case studies and patient files are included throughout to demonstrate refunds and appeals, auditing, and compliance, Medicare calculations, and professionalism. The Third Edition includes 2017 ICD-10, CPT, and HCPCS codes; information about the ramifications of the Affordable Care Act; and current information on health care changes, trends, and the future of health care. 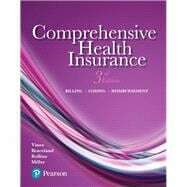 For even more practice and review opportunities pair Comprehensive Health Insurance with the Student Workbook. The Workbook (ISBN: 0134787293) contains key terms, chapter objectives, chapter outlines, critical-thinking questions, practice exercises, review questions, and end-of-workbook tests/case study-type problems that test student knowledge of the key concepts presented in the core textbook. MyLab is an online homework, tutorial, and assessment program designed to work with this text to engage students and improve results. Within its structured environment, students have ample opportunity to practice what they learn and test their understanding to better absorb course material and understand difficult concepts. Deborah Vines has worked extensively for more than 30 years in the healthcare industry as a practice administrator and manager in physical therapy, dermatopathology, and pediatrics. She has also held management positions in the hospital setting. As director of operations for a national healthcare staffing corporation, she has traveled across the United States, working directly with physicians and medical human resources personnel to secure jobs for individuals in the medical billing, coding, and collection fields. One of Ms. Vines’s mentionable achievements is that in one fiscal year, through mentoring and training, she assisted 300 recruits to find employment in the medical billing industry. This achievement led her to opening Allied Career Center in Dallas, Texas, a successful vocational school specializing in medical office specialist training. Ann Braceland, NCICS, has been working in the medical field since graduating from Gwynedd Mercy College with an associate’s degree in nursing science. As a practice manager, her extensive work in the field of managed care and medical billing and coding have allowed her to research and find means to inform others through her teaching of the changes and challenges that arise in the medical field. Mrs. Braceland has established and managed satellite offices in physical and occupational medicine. She is a Medicare representative with a vast spectrum of knowledge that she uses to train staff and physicians in compliance coding and billing. As director of training for the instructors of Allied Career Center in Dallas, Texas, her presentation of the material for students led to the publication of this book. Mrs. Braceland is a National Certified Insurance and Coding Specialist. Susan Miller has worked in the health care Industry for 25 years, managing and supervising medical billing processes. She has lectured in a classroom setting, providing students with knowledge and skills on medical billing and coding. Ms. Miller continues her health care career in Medical Billing, providing support to staff members on billing & coding guidelines.